What's better than buying DRM-free ebooks at a decent price? Being able to buy them on your mobile device and read them right away, that's what. The site includes a mobile version of Baen's Bar webforum, the news feed with details about book releases and the Baen Free Radio Hour podcasts, and of course a mobile version of the Baen ebookstore. That last feature was the most important to me; I love reading on my Android tablet, and I've always wanted to not have to sideload ebooks and instead buy them from the tablet itself. Alas, we're not quite there yet. 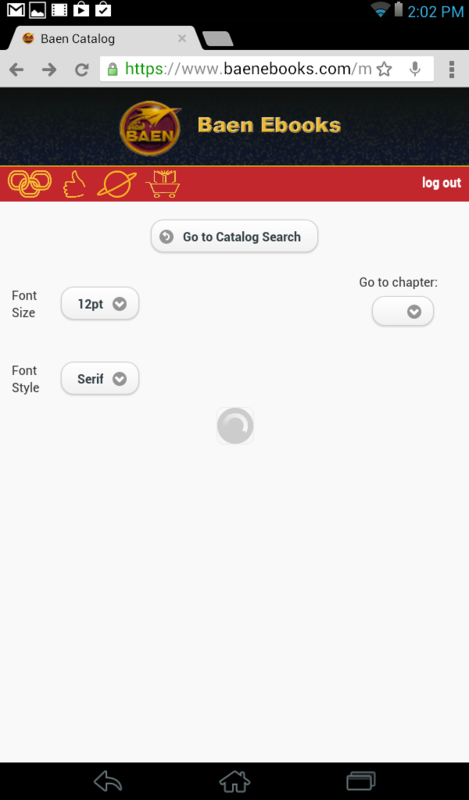 Baen's mobile site will let you buy ebooks, and it has an option to let you read them in a new mobile friendly version of Baen's reading app, but the mobile site won't actually let you download all of the ebook formats (you can however send an ebook to your Kindle account). Update: It's 3 weeks later and you can now download Epub and RTF, which is a start. The download feature has not yet been added to the mobile site, IMO limiting its usefulness. But I have high hopes that this will change. The site is in beta, after all, just like the mobile apps. I don't have specific details on an Android app, but they're hoping to get the iPhone app into iTunes in the next couple weeks. 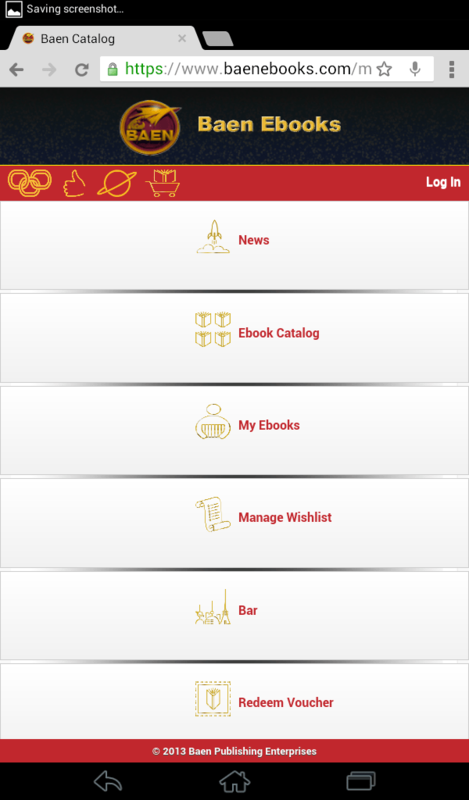 Update: You can find a beta version of the Android app over on Baen's Bar. I don't know about you but I am looking forward to the mobile apps and the finished mobile website. Baen's regular website is okay, but it doesn't exactly work well on any screen smaller than the iPad. In the past I have tried keeping my ebook library synced to Dropbox (a personal cloud, if you will) which I would then download on my mobile device, but that's never really appealed to me. It worked, but it was really simply another way to sideload the ebooks. I would much prefer a more direct option. Until the mobile site is operational I will probably continue to rely on Baen's support for the OPDS standard. A number of reading apps (including Aldiko, MoonReader, FBReader, and others) support in app downloads via the OPDS standard. This works well but you can't use it to buy ebooks from Baen, only download.